If you’ve taken a molecular biology class, the name “Okazaki” might sound familiar to you. 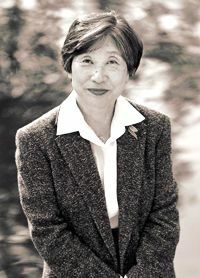 Together with her husband Reiji, discovered “Okazaki fragments” – short stretches of DNA that are formed in the process of DNA replication (copying DNA before cells divide so that each gets a copy). This discovery was only one of the many significant steps she made in understanding how replication works. The two strands of double-stranded DNA go in opposite directions, but the DNA copying machinery can only go in one direction. So how is the second strand replicated? The Okazaki’s proposed a “discontinuous growth” mechanism whereby the second strand is made in small pieces that are later joined together. And, working at Japan’s Nagoya University, they found the evidence to prove it. These pieces were named in their honor by Rollin Hotchkiss during a meeting here at Cold Spring Harbor Laboratory (CSHL) in 1968. Tsuneko and her husband made a great team, but he passed away from leukemia in 1975. At the time, female scientists in Japan weren’t recognized as “full-fledged researchers” – she had been working in “Reiji’s lab” and many people expected her to give up her research after his death and go back to a more traditional role as a stay-at-home mother. Even before Reiji’s death, it had been hard to find child-care and Tsuneko had even participated in a citizen’s campaign advocating for child-care. Despite her love for her work, Tsuneko might have quit her research if it hadn’t been for a letter of support she received from Arthur Kornberg, whom she had worked with as a Fulbright fellow at Stanford University, who told her: "never give up the research; the world is waiting for the outcome of your research at Nagoya.” And a neighbor stepped in to help care for her children (a son in 6th grade and a 2-year-old daughter). Tsuneko carried on their work, discovering the RNA primers that serve as “start stations” for the copying machinery. And she has “paid it forward,” advocating for women in science as well as for lower education costs (she even paid the way through graduate school for one student out of her own pocket).